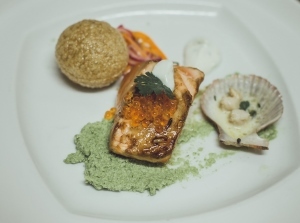 Guests were treated to a delectable seven course meal prepared by the Durban International Convention Centre’s Executive Chef John Moatshe and his team when the Centre hosted the induction and gala dinner (Chapitre) of the Chaîne des Rôtisseurs Bailliage de KwaZulu-Natal on 28 February 2019. The Chaîne des Rôtisseurs is the world’s oldest, largest and most prestigious food and wine society which was founded in Paris in 1248 and has more than 25,000 members in over 80 countries around the world. 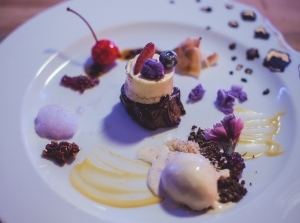 The association promotes the art of fine dining, cuisine and supports the development of young culinary professionals, from all over the world, be it restaurateurs, hoteliers, executive chefs or sommeliers. 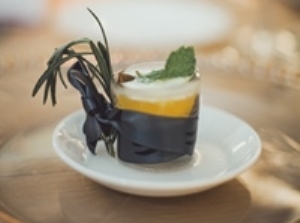 There were no condiments on the tables so that guests were able to enjoy the taste and flavours of the exquisite gourmet food that the Durban ICC’s chefs spent hours to prepare. The highlight of the evening was the “magical flaming” dessert which left guests’ tongues wagging. Chef Moatshe said it was important for chefs to be part of the Chaîne des Rôtisseurs so that they can be exposed to different culinary techniques and latest trends. 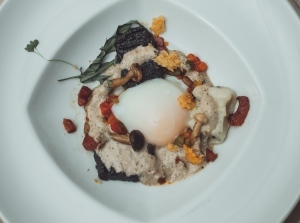 “Chefs can only grow by being exposed to each other and challenged to learn and develop, so the Chaîne des Rôtisseurs aims to provide a platform for chefs to showcase their individual talents. This allows them to learn and experience creativity in ways that they are not normally exposed to in their everyday work situations,” he said. Chef Moatshe has served 10 years as the Chaîne des Rôtisseurs member, and was also a member of the original team which opened the Durban ICC in 1997. He started in the position of Chef Saucier before rising through the ranks to become the Centre’s Executive Chef in 2009. Chef Moatshe has been the Durban ICC’s Executive Chef for 10 years and was awarded the prestigious Chaîne des Rôtisseurs Brass Plaque/Blazon in 2013 and the Commandeur Silver last week for his achievements in the culinary field. Chaine de Rôtisseurs Bailli Délégué South Africa Philip Mostert said the Chaine de Rôtisseurs gives back to the community and skills development in two ways. “We have our Association Caritative de la Chaîne des Rôtisseurs (ACCR) projects, these are social outreach projects around the world and we contribute financially and with the sharing of resources. The main aim is to aid the development and placement of trainee chefs in the industry. The second way is with our two international competitions (chefs and sommeliers), these are hosted in all regions and countries. These winners then go on to compete internationally. All contestants are under the age of 27 and in junior positions,” he said. Durban ICC Chief Executive Officer Lindiwe Rakharebe said delegates visiting the Durban ICC can look forward to the Centre’s superb standards of culinary excellence and hospitality. 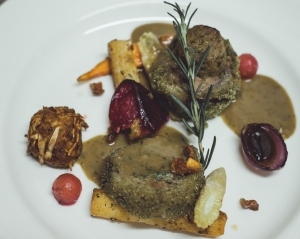 “As part of the Durban ICC’s gourmet evolution over the past 21 years in the industry, we are reinventing our culinary offering in order to showcase some of our authentic African Cuisines,” she said. 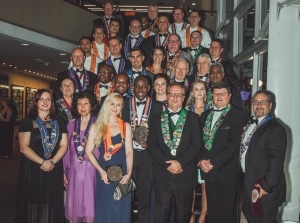 The Chaîne des Rôtisseurs induction ceremony held at the Durban International Convention Centre on 28 February was followed by a gala dinner prepared by the Centre’s Executive Chef John Moatshe and his team. The Chaîne des Rôtisseurs is an active community of professionals and food enthusiasts, sharing a passion for the culinary arts.